My desk sucked. Look at that piece of junk. 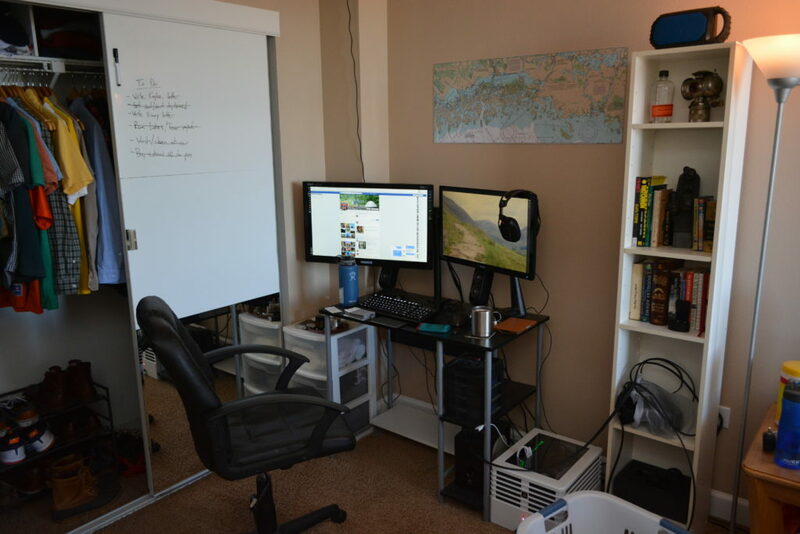 Headphones hung on the monitor with no room for the stand, Vive stuffed unceremoniously in the bookshelf to the right. 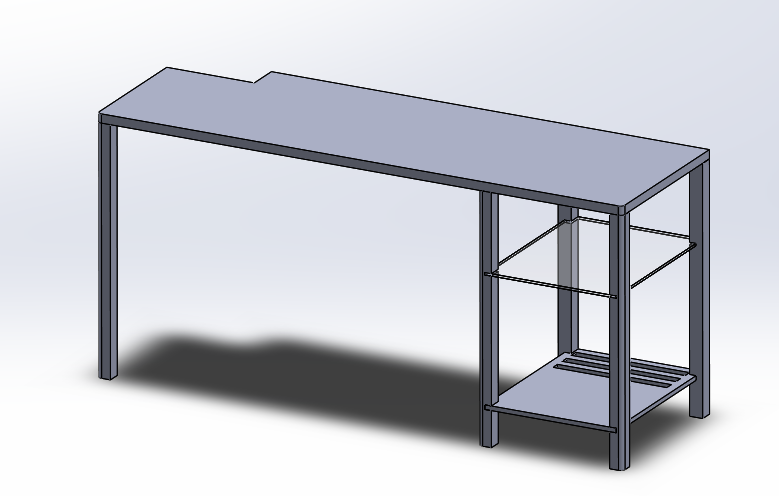 I’d been thinking about designing a new desk pretty much since I got this one for free off a sidewalk, but it never progressed out of sketches. Nothing flashy, but it uses my space more efficiently and it gets my computer off the ground to give it some airflow. 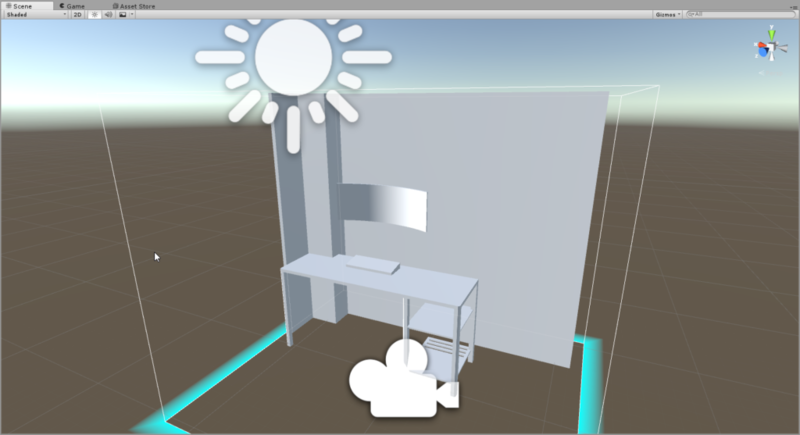 I used this .obj export macro to get my desk from Solidworks to Unity, and placed it into my environment. 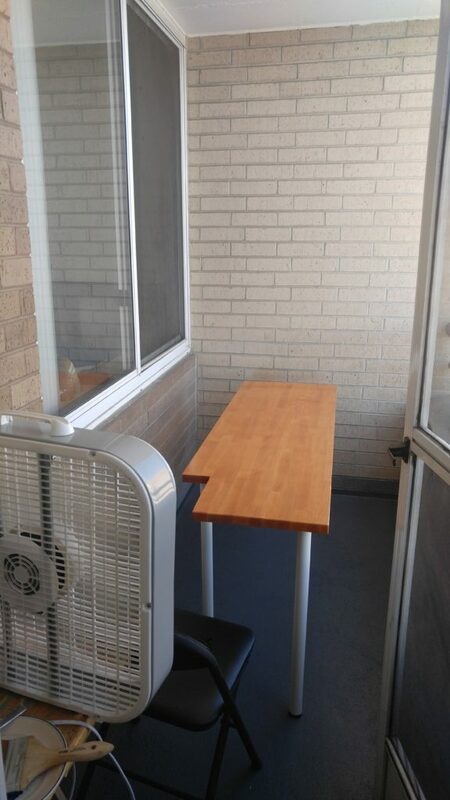 The white box is my playspace boundary, I positioned the desk so that it lines up to where by current desk actually is. 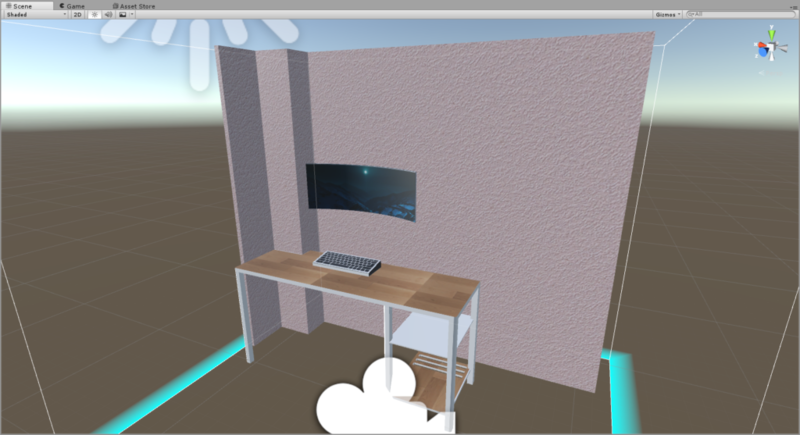 This was pretty trippy, I could reach out in VR to touch the edge of my virtual desk, and would connect with my real desk. 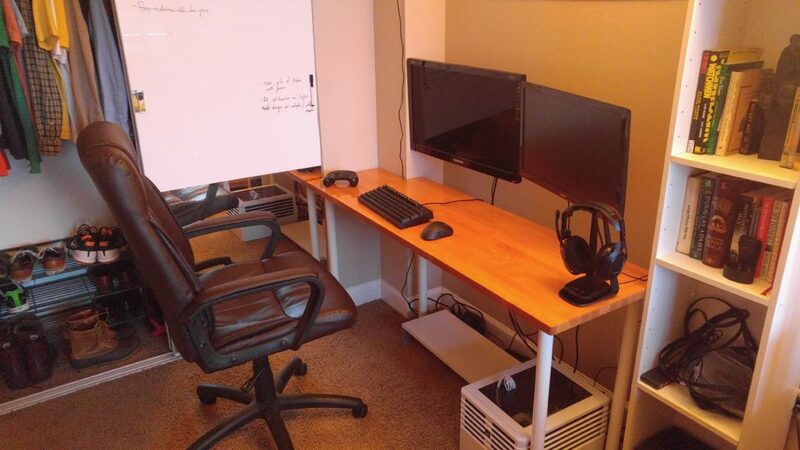 For added immersion, I added in my walls, (future) monitor, and keyboard. I made the keyboard and monitor physics objects so I could interact with them, and created a collision mesh for the desk top so I could drop the keyboard onto it. 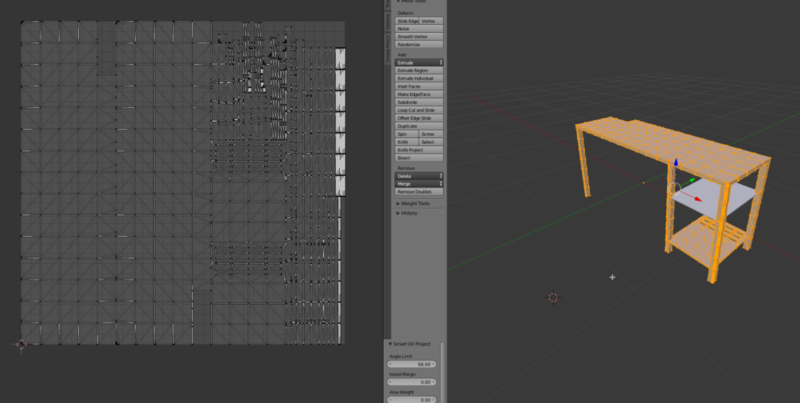 To get rid of the drab grey textures, I took the Solidworks .obj into Blender and UV unwrapped the file. 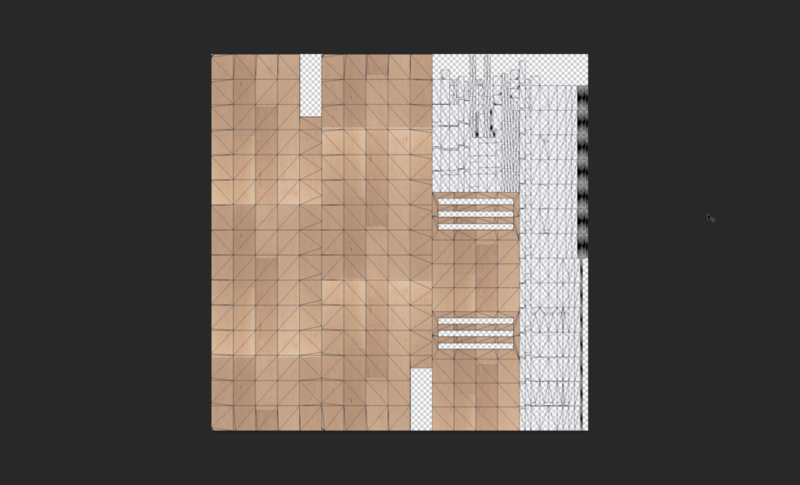 Taking this into Photoshop let me apply some texture to the objects and place them back into Unity. Repeat for monitor, keyboard, and walls. 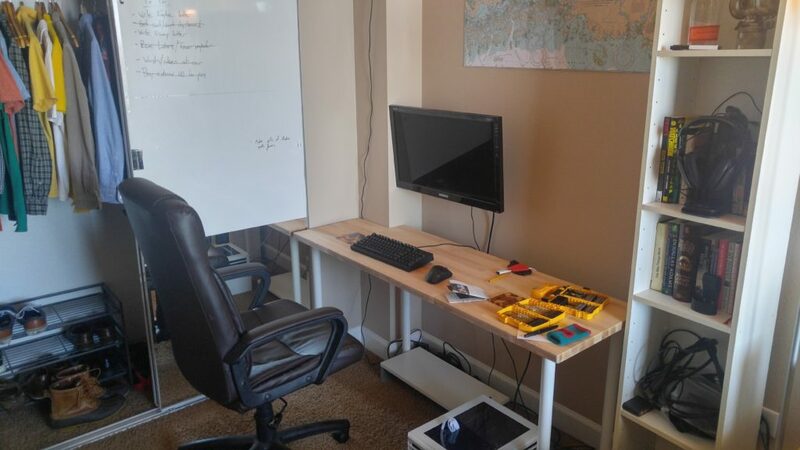 At this point I got pretty impatient and just wanted to build the damn thing, so I headed to IKEA and bought their Gerton table top, which is a 30×60″ piece of maple. With the help of the woodshop at the TinkerMill in Longmont, CO, I cut it to shape and trucked it back to my aparment. I screwed some cheap $4 IKEA legs onto it, just to get it upright. 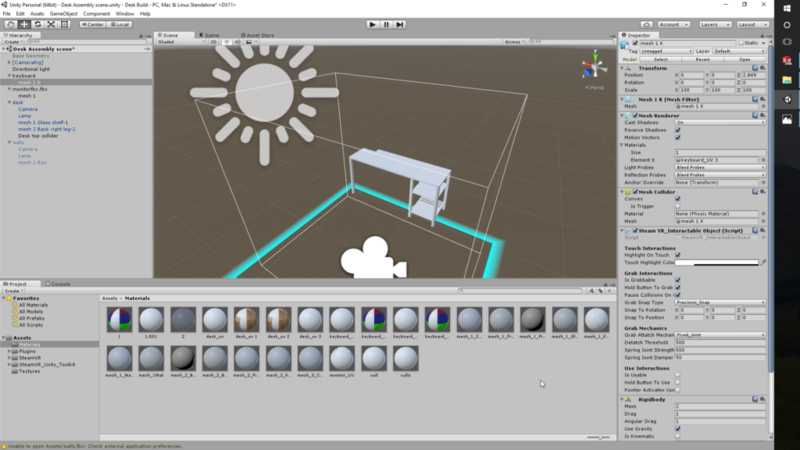 I plan to build the base for it as well, but that’ll come later. I didn’t like the very light color, so I got some MinWax Golden Pecan wood stain and MinWax poly and got a weekend of good weather out on the balcony. Two stains and three coats of poly later, I want to call the top done! Final glamor pic, loving it so far. Feel free to post any questions about the process down in the comments. Thanks man, this project was a lot of fun. I’m kinda curious, how did you find this page? I haven’t really linked to it from anywhere that I know of.